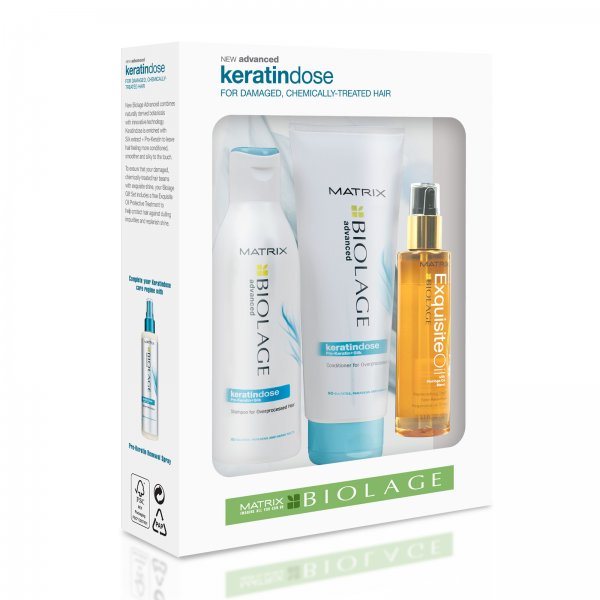 Product information "Matrix Biolage Keratindose Gift Set"
Indulge chemically damaged hair with a stylist-prescribed healing formula. Merging the power of nature and molecular science; Biolage Keratindose uses a formula which is specifically designed to treat high levels of chemically-treated; damaged and fragile hair. By moisturising over-processed hair; Biolage Keratindose nourishes and prevents damage while keeping hair soft; silky and manageable. Gift set contains: revitalising shampoo (250 ml); healing conditioner (200 ml) and Exquisite Oil (92 ml) replenishing treatment. Related links to "Matrix Biolage Keratindose Gift Set"
Customer evaluation for "Matrix Biolage Keratindose Gift Set"